A Bangladeshi farmer has shown his support for Germany’s World Cup hopes in an unusual way – with a home-made flag 5.5km (3.4 miles) long. Amjad Hossain, 69, says his love for the country began after he used German homeopathic medicine for a gallstone. He started working on the flag two years later when Germany hosted the 2006 World Cup, and has continued to add to it in subsequent tournaments. He has even sold land to buy enough black, red and gold fabric. The flag was unveiled at a school in Mr Hossain’s hometown of Magura, around 60 miles (100 km) to the west of the capital Dhaka, on Tuesday. This is not the first time Mr Hossain has made headlines with his flag. 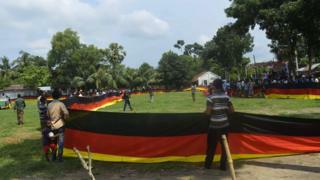 During the last World Cup in 2014 – when the flag was a mere 3.5 km long – the German embassy in Bangladesh awarded him a life-time membership of the German national team’s official fan club, a football, a team jersey and a certificate of appreciation.